One of the joys of being a grandparent is opening your grandchildren’s eyes to the world about them. This past Thanksgiving we took our grandchildren to Italy to do just that. Our grandchildren travel more than most kids, with much of their travel on cruise ships. 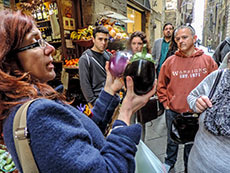 We wanted, though, to provide them a taste of another culture, in this case Italy, beyond that normally experienced during on a one- or two-day shore excursion. 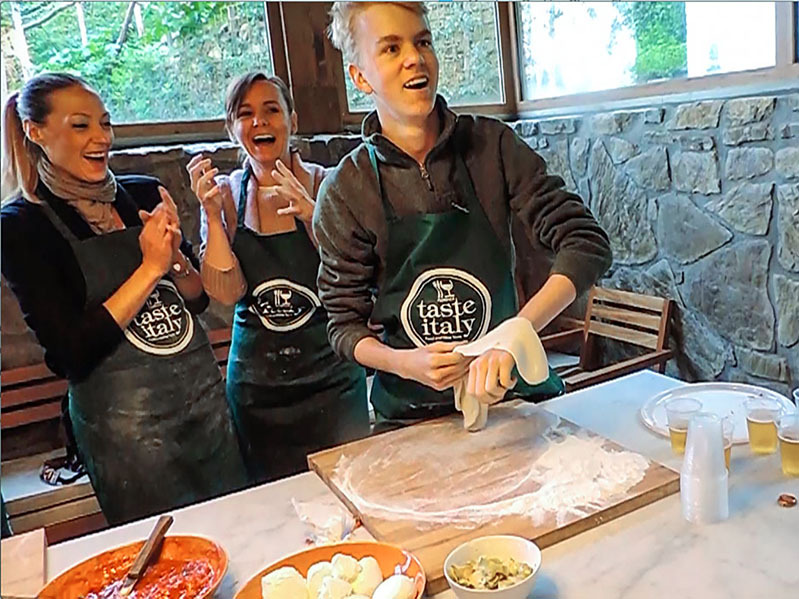 My husband came up with the idea that the six of us – my husband and myself, teenagers Megan (17) and Ryan (15), and their parents – take a cooking class in Florence. It turned out to be not just a class but also a great experience for all of us. Our tour began at 9:45 in the morning at the offices of Walkabout Tours, thankfully centrally located only a block away from the Palazzo Vecchio. There we met Mara our tour guide, a young, energetic women, who was fluent in English. Mara signed us in, asked us a little about ourselves, and was intrigued by the fact that we were a three-generation family traveling together. 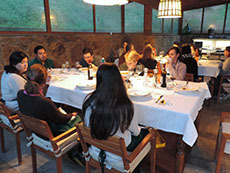 Ten other people, all also from the States and who had different but equally interesting stories, soon joined us. After we quickly exchanged info about ourselves and our travels, Mara led us off to the market to buy food for our class. While meandering through the narrow streets of Florence on the way, she continually pointed out interesting Italian food- and wine-related sights. The first were the little tabernacle-shaped windows on the side of many buildings, most now filled in with bricks, which were originally used to deliver wine to houses. Later, as we passed the Duomo, she explained that when the dome was constructed the contractor became so dismayed by time lost by workers climbing up and down the structure for lunch that he constructed a kitchen halfway up the dome so their meals could be prepared on site. 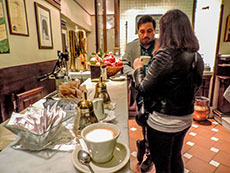 We were soon at the Cantinetta dei Verrazzano, a bakery/restaurant owned by the esteemed Verrazzano winery in Chianti, where we were treated to a coffee – in my case, a cappuccino, my favorite – and purchased the bread for the meal. It was Tuscan bread, prepared without salt, explained Mara, because when the Italian states were unified long ago, a salt tax was levied and in protest the Florentines decided to bake without salt. After an easy hour walk we arrived at the Mercato Centrale in the city’s San Lorenzo neighborhood. It was a sizable building, remarkably clean and modern inside, with stalls for every food imaginable, from cheese, olive oil, fish and meat to beautiful fruits and vegetables. At a butcher we bought fresh veal that was ground in front of us, as well as a sizable pork loin that Mara had deboned and wrapped with the bone reattached. At other stalls we added buffalo mozzarella, plump fresh tomatoes and fresh spices to our market basket. We were then off outside to board a small bus that would take us to the farm. After 30-minutes or so we arrived at the farmhouse. 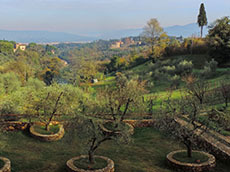 It was on a hillside with magnificent views of the surrounding countryside and the city in the distance. As we walked to the house we were met by a sizable St. Bernard, owned by one of the workers, who was playing with a much smaller but definitely dominant terrier. Although he was only 8 months old it still took two men to hold him back so he wouldn’t romp among our group. Up to this point Megan and Ryan had appeared somewhat blasé about the experience but the view, the dogs and the farmhouse seemed to change their moods. Inside the wooden-framed farmhouse we found the most incredible kitchen, one that I – and I’m certain many others – would kill for. Beyond two large marble-topped wooden tables, was a massive four-burner gas stove and oven with water circulating beneath the burners to keep the stovetop clean. High-beamed ceilings and glass walls allowed natural light to flood the room. It was in this amazing kitchen that the magic began. 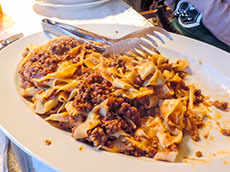 The first plate we prepared was ragu that needed to simmer for two or three hours. For our preparations we were put at stations along the tables and began slicing, chopping and mixing. As we were given onions, carrots and celery each of us was assigned a task, with the fruits of our labors then tossed into a pot with ground veal and lots of olive oil to brown and cook. Carmela, our lively cook and teacher, for whom Mara interpreted throughout the day, soon had us rubbing a mix of basil and garlic on the pork roast and potatoes. Wasting no time, Carmela then had us preparing bruschetta, our first course. When we’ve attempted making good, tasty bruschetta at home it seemed relatively difficult but Carmela showed us how to do it quickly and easily. We chopped tomatoes, basil and garlic, which we then mixed with salt and set atop the lightly toasted Tuscan bread, drizzled with olive oil. Its taste was amazing, likely due to the fresh ingredients, and I can’t remember the last time I had tomatoes with such a rich taste. And, since we were in Italy, all of our work was accompanied by ample glasses of wine. Time flew by quickly and we were soon making pasta, which we also found incredibly easy using just a cup of flour and one egg. Carmela, however, warned us that to make really good pasta you need to sing while rolling out the dough. After our handmade pastas were put aside to later cook with the ragu, we prepared to make pizza. I had guessed we would be doing so since soon after our arrival a farm worker had begun stoking the outside wood-burning oven and by this time its temperature had risen to 600°+. 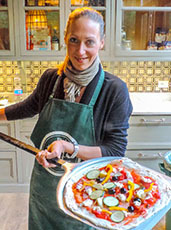 Carmela’s niece Arla, a “pizzaiola” at Cucineria La Mattonaia in Florence, and who had arrived earlier, would be our pizza-making teacher. She first showed us how pizza dough is made and then brought us dough which had already been rising for 48 hours. 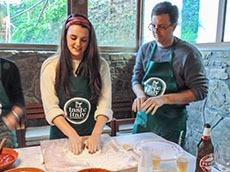 In pairs we rolled out the dough for individual pizzas, with a few brave souls tossing it into the air. Plenty of ingredients were put on the tables and after we each designed our own little masterpieces – again, it was all incredibly simple – we put each in the hot oven outside. Amazingly it took only about 1½ minutes to make the dough rise and the crust brown. We all found the fruits of our labors delicious. Even I, who doesn’t particularly enjoy pizza as a rule, ate every bit. There is something to be said for fresh-made with fresh ingredients. Before sitting for our main course we prepared Amaretto gelato and tiramisu. The main challenge, many of us quickly realized, lay in the separation of the egg whites and yolks, and later adding sufficient Amaretto to the gelato. After finishing the tiramisu and putting the gelato in the freezer, we sat down to eat our pasta and ragu, and the pork loin with potatoes. It was a delicious meal and we were all completely satiated. The dessert, which I rarely eat, was over the top. It was a longish day and was around 5pm when we headed back into town, all of us totally delighted with what we had experienced, learned and eaten. More importantly, we found it to be the best investment of a day in Italy, a cultural adventure none of our three-generation family will soon forget. 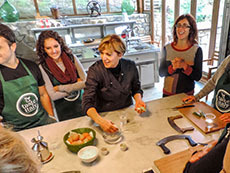 The cost of the Florence food tour and cooking class at a farmhouse in Tuscany is €80 per person, about $100. The company also offers numerous other tours. Looks like a great tour! Nice to see photos of Kimi, Steve and the kids. It was a great day for us all and very special to see Megan & Ryan getting into cooking. Loved the article and how special it was for all of you. So glad you liked it…it was a wonderful experience that I highly recommend to anyone who goes to Italy and has the time. I can attest, it was a wonderful day! I HIGHLY recommend this tour to others when visiting Florence.